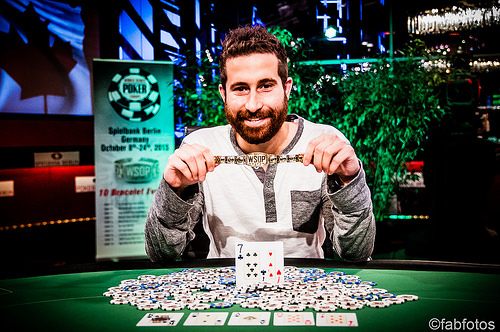 The star-studded final table of the 2015 World Series of Poker Europe €25,600 High Roller saw six players out of a 64-entry strong field return to the feature table at the Spielbank Berlin. Mustapha Kanit was holding a commanding lead over his five rivals, but the Italian eventually had to settle for third place. In a brief heads-up of less than two dozen hands, 2010 WSOP Main Event champion Jonathan Duhamel defeated Triple Crown winner Davidi Kitai to even out both contenders at three coveted bracelets each. Duhamel (5th) and Kitai (6th) started at the bottom of the chip counts when play resumed in level 21, with blinds at 12,000/24,000 and a running ante of 4,000. Yet it was Fedor "CrownUpGuy" Holz who was sent to the rail first. Duhamel and Kitai doubled up early on, and Holz's moves sent him back into last place before committing most of his remaining chips preflop with . Duhamel moved all in with and Holz called off to bust after a board of . The second elimination was the only remaining player from Germany. 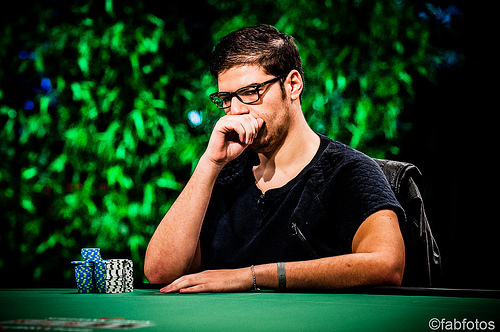 Christoph Vogelsang min-raised with and Kanit defended his big blind to check-raise all in after the flop . Vogelsang called and was shown for a gutshot, which immediately completed on the turn to leave Vogelsang drawing dead and making the river a formality. Kanit had regained the lead, only for Duhamel and Kitai to double up through him. Sam Chartier's ill-timed bluff against French-Canadian Duhamel with on the board was called and Duhamel's left his countryman on the short stack. Chartier then shoved with the last few big blinds and only for Kanit to wake up in the small blind with . The board ran out to give Kanit trips and Chartier was gone in fourth place. Kanit then called three barrels by Kitai on the board and mucked after the final bet when he was shown for a pair of nines only. The Italian shoved for his last 1 million chips soon after out of the small blind with and Duhamel called in the big blind with . The board sent Kanit to the rail in third place and set up the duel for the High Roller title with a slight lead for Duhamel. Fireworks started straight away and Duhamel quickly gained a more than 3-1 lead. Kitai doubled up once with versus before falling back again. The final hand saw Kitai shove the small blind and Duhamel called with the Belgian in bad shape. The flop was a nice sweat for yet another possible comeback story, however the turn and river were both blanks. It is the third career bracelet for Duhamel and the second in 2015 after taking down the $111,111 No Limit Hold'em High Roller for One-Drop (Event #58) in Las Vegas this summer as well. 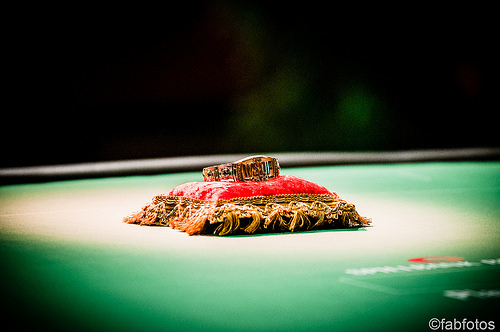 Kitai is denied his fourth bracelet and receives a payday of €342,620 as consolation, further cementing his first place in the all time money list of Belgium. 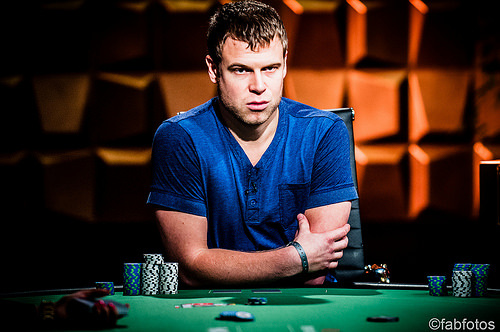 Davidi Kitai moves all in for 1,420,000 from the button, and Jonathan Duhamel calls. The flop provides a nice sweat, as Kitai picks up the only flush draw. The turn and river are blanks, though, and Duhamel wins the pot with a set of sevens. 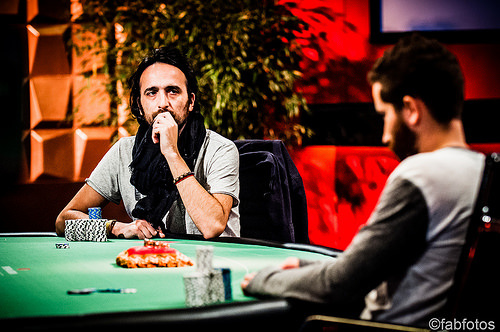 Kitai finishes as the runner-up, earning €342,620. Jonathan Duhamel is the High Roller champion, claiming his third gold bracelet and the €554,395 top prize. 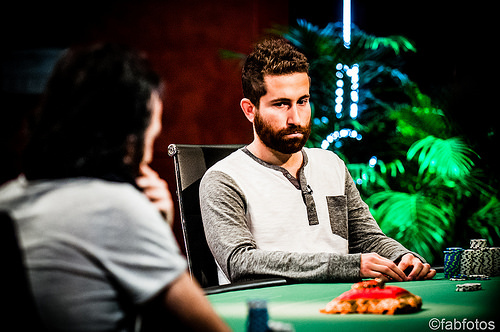 Jonathan Duhamel moves all in from the button, and Davidi Kitai folds. The next hand, the action reverses, with Kitai shoving and Duhamel surrendering his big blind. Davidi Kitai min-raises to 200,000 from the button, and Jonathan Duhamel defends his big blind. The flop is . Duhamel leads for 130,000, and Kitai moves all in. Duhamel folds. Davidi Kitai opens to 160,000, and Jonathan Duhamel three-bet shoves. Kitai folds. Duhamel limps the button on the next hand, and Kitai checks his option. The flop comes , and a bet from Duhamel wins him the pot. In the eighth hand of the heads-up match, Davidi Kitai moves all in for 1,030,000, and Jonathan Duhamel calls. The board runs out and Kitai doubles up with trip kings. Davidi Kitai opens to 160,000 on the button, and Jonathan Duhamel calls. The flop is . Duhamel checks, Kitai bets 90,000 and Duhamel check-raises to 270,000. Kitai calls. The turn is the , and Duhamel leads for 425,000. Kitai calls again, and the river is the . Duhamel moves all in, and Kitai folds. In the first hand of heads-up play, Jonathan Duhamel raises to 200,000, and Davidi Kitai three-bets to 500,000. Duhamel folds. The next hand, Kitai min-raises to 160,000, and Duhamel three-bet shoves. Kitai folds. On the third hand, Duhamel opens to 200,000 once again, and Kitai three-bets to 475,000. Duhamel four-bets all in, and Kitai folds. 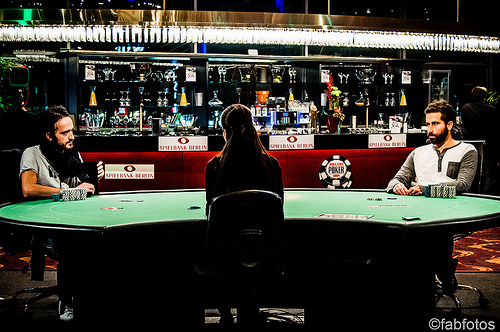 The players are back at the table, and the cards are back in the air. There are 26 minutes left in the current level. Davidi Kitai (three WSOP bracelets) and Jonathan Duhamel (two WSOP bracelets) are taking a 15-minute break midway through the level. Mustapha Kanit moves all in for exactly 1,000,000 in the small blind, and Jonathan Duhamel calls in the big blind. Kanit has the shorter of the two stacks, so he is the player at risk. The flop is a miss for Kanit, and the steals half of his remaining outs. The river is the blank , and Duhamel wins the pot with ace-high. Kanit is eliminated. 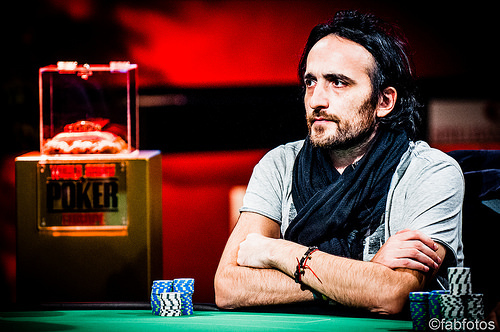 Davidi Kitai completes the small blind, and Mustapha Kanit checks his option in the big blind. The flop is , and Kitai leads for 80,000. Kanit calls. The turn is the , Kitai bets 225,000, and Kanit calls again. The river is the , and Kitai bets 450,000, about half his remaining stack. Kanit calls him down. Kitai shows , winning the pot with a pair of nines. In a battle of the blinds, Davidi Kitai opens to 190,000, and Mustapha Kanit three-bets to 430,000. Kitai folds. Sam Chartier moves all in for 315,000 under the gun, and Mustapha Kanit calls from the small blind. The flop is a miss for Chartier, but he picks up a gutshot straight draw with the on the turn. The river is a blank for him, though, and Kanit wins the pot with a set of tens. Chartier is eliminated. Mustapha Kanit opens with a min-raise to 160,000, and Davidi Kitai defends his big blind. The flop is and a continuation bet from Kanit ends the hand. Jonathan Duhamel completes the small blind, and Sam Chartier checks his option in the big blind. The flop is . Duhamel leads for 80,000, and Chartier raises to 175,000. Duhamel calls, and they both check through the turn. The river is the , and Duhamel checks again. Chartier bets 215,000, and Duhamel calls. Chartier shows for queen-high, and Duhamel's wins the pot with two pair. Mustapha Kanit completes the small blind, and Jonathan Duhamel checks his option in the big blind. The flop is , and Kanit leads for 60,000. Duhamel calls. The turn is the , and Kanit's second bet of 110,000 earns him the pot. One hand later, Kanit opens the button with a min-raise to 120,000, winning the blinds and antes. Jonathan Duhamel moves all in for 635,000 under the gun, and Mustapha Kanit calls with the covering stack in the big blind. The door card is the , but the flop rolls out to give Duhamel a set of tens. The on the turn ends the hand, and the meaningless river completes the board. Duhamel doubles up, and Kanit is suddenly the shortest stack at the table.